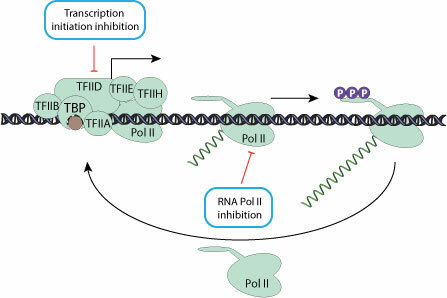 Host RNA polymerase II (RNA pol-II) is the major enzyme responsible for transcription of mRNA from a DNA template strand. Some viruses interfere with host RNA pol-II function. They may either mediate its ubiquitination and subsequent proteasomal degradation, or inhibit RNA pol-II phosphorylation thereby lowering its efficiency. They can as well interfere with initiation factors. Inhibiting host transcription eventually leads to shutoff of host proteins expression and gives viruses transcripts a competitive edge for access to the cellular translation machinery. Preventing the expression of host proteins is also a strategy to counteract the antiviral response.